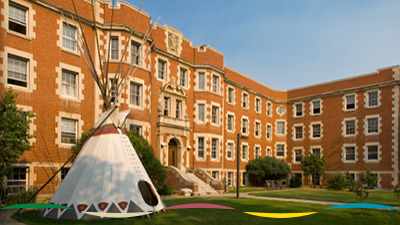 The Faculty of Native Studies at the University of Alberta is a leader in teaching, research and education concerning Indigenous peoples and understanding their histories and contemporary realities. 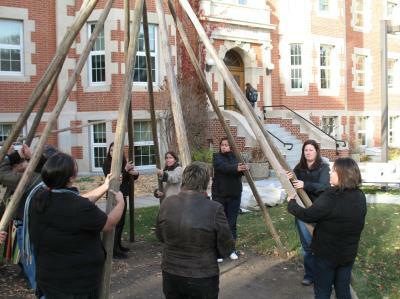 The Faculty of Native Studies is the University of Alberta’s longest running, most successful Aboriginal engagement initiative. The Faculty’s interdisciplinary programs and service to community rest on a foundation of deep respect for the knowledge and traditions of Canada’s First Peoples, and their place in contemporary Canada. It provides a common ground for Aboriginal and non-Aboriginal student to explore and critically examine the historical and contemporary relations that concern Aboriginal peoples that impact all facets of Canadian society. Through consultation and needs assessment, the Faculty has identified the following leading priorities for charitable giving. We encourage our alumni and friends to consider these when contemplating a gift in support of Native Studies. The Faculty of Native Studies seeks to develop sustained financial support for the Aboriginal Governance and Partnership program to bridge the leadership gap that exists among Aboriginal and non-Aboriginal organizations. The program empowers students to develop the necessary understanding, competencies, tools and techniques to effectively lead, work and partner with Aboriginal and non-Aboriginal businesses, communities, organizations and government. Its focus is on the development of knowledge while increasing analytical and applied skills suited to the unique governance issues and opportunities facing Aboriginal peoples and their non-Aboriginal partners. University of Alberta Member, United Nations Permanent Forum on Indigenous Issues. Throughout the year, Native Studies undergraduate and graduate students alike are presented with emerging and unforeseen opportunities to enhance their educational experience. Things like the cost of travel to a symposium or conference, to conduct field research, to acquire new books and equipment, or the expenses associated with bringing Aboriginal leaders and experts to our Faculty for teaching and research presentations. All of these require financial resources that fall outside of the Faculty’s limited budget. By contributing to the Native Studies Learning Opportunities Fund, donors help to ensure that there is support available for students to tap into so they can maximize their access to learning opportunities while studying at the University of Alberta. The Faculty supports a Reading Room for research relating to Aboriginal & Indigenous issues. The Reading Room is a major resource for all of our students; this fund allows our Faculty to select new materials annually to keep our highly specialized collection current and staffed for student use. Our students face the reality of rising tuition costs. Factoring in the higher cost of textbooks, other materials and housing make the task of concentrating on studies all the more challenging. Contributing to the Student Support Fund will help improve student financial aid and employment opportunities through significant investments in undergraduate scholarships and bursaries, academic advising, undergraduate research opportunities and undergraduate internships and community programs/ capstone course replacements. These initiatives will ensure that an education in Native Studies is accessible to as many students as possible. Support in this area will assist in relieving some of the financial burden our students face, and improve their ability to concentrate on their studies and succeed. The Elders Program in the Faculty is driven by an Endowment created May 2001 that allows the Faculty to host extended visits of Elders to participate in our activities. Specifically: (1) to connect the UofA’s academic teaching about Aboriginals more closely to Aboriginal Communities; (2) to have Aboriginal community Elders accessible to instructors for classroom purposes; and (3) to promote the UofA’s commitment to diversity of knowledge on the campus among different types of Aboriginal communities.